Figure 14. Steer with proper front leg structure. Figure 15. Female exhibiting the knock-kneed and splay-footed conditions. *This is an excerpt from Beef Conformation Basics, ANR-1452. From the front, cattle whose hooves are faced forward are ideal. 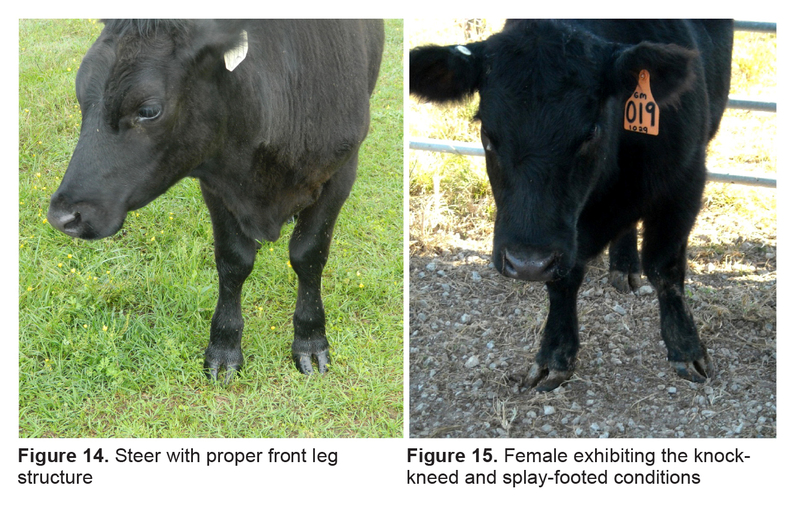 The steer shown in figure 14 is a good example of both hooves pointing directly forward. Much as it is with the hind legs, some angle in the outward direction is acceptable, and any angle of 10 degrees or less is accepted as normal. Functionality of the front end is normally not compromised until the outward turn approaches 30 degrees or more. Cattle with this condition are commonly referred to as being splay footed. Cattle that are splay footed can usually also be classified as being knock kneed. Figure 15 is a good example of a heifer having both of these conditions. Another condition in beef cattle concerning the front limbs occurs when the front hooves point inward toward each other. Cattle exhibiting this condition are said to be pigeon toed. This condition is rarely seen and is detrimental to the functionality of the forelimbs. Read here to learn more about beef conformation basics. Download a PDF of Beef Conformation Basics, ANR-1452. The two points of reference to be aware of in evaluating the hip are the hooks and pins. Both points are identified in Figures 16 and 17, with the pins being the point beneath the tail head. Although some breeds, such as those influenced by Brahman genetics, are less likely to be level, the ideal beef animal would be nearly level from hooks to pins. Although it is not always the case, a level hip normally equals a longer, more muscular hip if for no other reason than length itself. Also, a level hip is normally considered more eye-appealing. As the hip becomes less level, it can become shorter and be associated with other issues such as cattle having their hind legs placed too far beneath them. Some producers have defended cattle with a minor slope from hooks to pins by saying these cattle have an advantage when it comes to calving and expelling afterbirth. As long as the slope is not extreme, not much compromise is made in regard to structural correctness. One of the more problematic arrangements of the hip can be found when cattle are higher at their pins than at their hooks. In females, this can lead to problems with calving and expelling afterbirth. 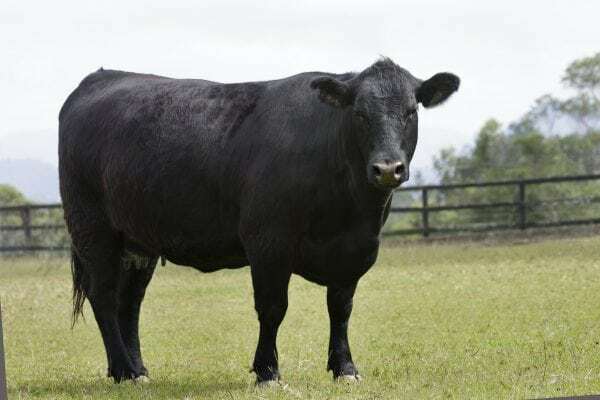 Although the calving problem is only expressed in females, breeding bulls exhibiting this characteristic should be selected against as well in order to not perpetuate the characteristic. When evaluating beef cattle from the rear, hooves of the animal should point forward. However, that is not the case in a large number of beef cattle. In many instances, the hooves of the hind legs turn outward instead of pointing forward. Cattle with this condition are commonly referred to as being cow hocked. The hocks are also usually turned inward and can be closer together than the hooves in some extreme cases. In milder cases, cattle are unhindered in terms of normal productivity. The steer shown in Figure 12 is slightly cow hocked but would be considered normal, as anything less than a 10-degree angle is considered as normal. In some extreme cases, this condition can result in uneven toe growth and wear. Cattle more extreme in this condition are usually very light muscled as is the heifer shown in Figure 13. Less commonly seen in beef cattle is the condition known as bowleggedness. This term is used to describe cattle whose hooves are pointed inward on their hind limbs. Though this term may also be used to describe a similar condition in the front limbs, it usually describes cattle that are farther apart at the hocks than at their hooves. This condition is considered more serious in terms of inhibiting proper mobility and is far less common in comparison to the cow-hocked condition. Even if hay was not submerged in water, heavy rains will likely decrease the quality of hay stored outside or on the ground. Hay that is submerged by as little as 1 foot has limited usable forage remaining. The amount of rotted hay, mold, and possible contaminants in flooded hay make it of little value and potentially a hazard to livestock. Hay that has less than 1 foot submersion may still have some usable forage, but it should be used with caution and should be fed only to cattle. For hay submerged less than 1 foot of water, feed the dry hay but do not force the cattle to consume the wet and rotting portion of the bale. be removed as soon as possible to prevent hay fires. This hay will begin to heat and spontaneous combustion is a possibility. Hay that is not fit for livestock should be disposed of by burning or composting it. Read more about Animal, Forage, and Feed Management Following a Flood Event. Download a PDF of Animal, Forage, and Feed Management Following a Flood Event, ANR – 2536.